It’s hard to believe that Mike Mignola’s Hellboy comics have somehow been around for 25 years, but it’s clear that in order to celebrate, you should do what Hellboy would recommend: Drink a bunch of beer. And maybe some tequila, too. But first, beer, and wouldn’t you know it—in honor of the anniversary, Portland’s Gigantic Brewing is producing a string of six special, limited edition Hellboy beers. 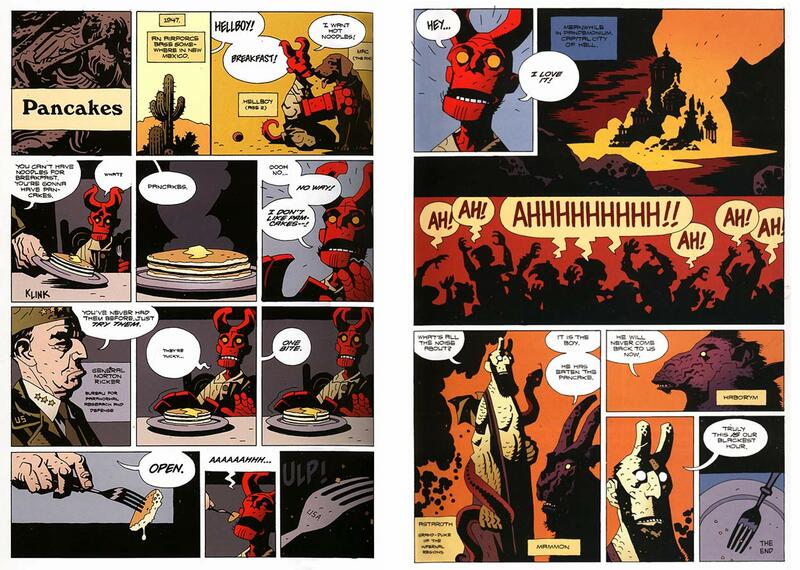 The choice of “pancake beer” is an especially inspired selection for Hellboy/Anung un Rama’s own beer, being a pitch-perfect reference to the beloved, two-page Hellboy story “Pancakes,” which is about … well, a young Hellboy eating pancakes. It’s amazing, and you should just go read it now. The other beers likewise fit with their characters—Liz Sherman gets a smoky chile stout to reflect her pyrokinetic powers, while fish man Abe Sapien gets something of the “indigo blue” variety. All of the beers are dialed in to 6.66 percent ABV, with the exception of Trevor’s English barleywine, which obviously demanded a bit stronger backbone. The official launch of the first Hellboy beer (presumably the pancake brew) will take place on March 15 as part of the Emerald City Comic Con in Seattle. The beer will then be made available in limited quantities across the U.S.—Gigantic says to check back for more details on that release on this page come March 1st. The brewery will also be releasing custom prints and T-shirts for each of the beers, with artwork from Mike Mignola himself. And lest we forget, Hellboy is also headed back to the multiplex soon. Neil Marshall’s reboot of the previously Guillermo del Toro-directed series hits theaters on April 12, 2019, starring Stranger Things’ David Harbour. If you’re lucky enough to score one of these beers from Gigantic, it will clearly make for the perfect accompaniment.